Have you ever parented through a really tough season? Ever been ready to just throw up your hands because you don’t know how to deal with your child? If so, I’m right there with you! Sometimes I find that I’m not parenting for my child’s sake. I’m not disciplining and discipling them for their own good and for God’s glory. Instead, I’m parenting for other people. I care more about what outside observers think of me as a mom than I do about what’s best for my child and our family situation. In other words, if I’m parenting so that people will think we have the “perfect” family and that I’m a great mom, then I’m missing the point. But for me, this can be hard. I want people to think I’m a good mom. I can get caught up in worrying about how my child’s behavior reflects on me. If she’s obeying, following all the rules while smiling and being respectful, I look like a good mom. On the other hand, if she’s throwing a temper tantrum in the grocery store aisle – or worse, in the church nursery – people will think I’m a “bad” mom. But our kids are people who are going to make mistakes. They will make poor choices, and sin…just like we do. But if they make those mistakes now, while they’re living in our homes, we can process them together. We can find truth in God’s Word to guide us, and hopefully turn the situation into a valuable life lesson. The closer I get to releasing teenagers out into the world to fend for themselves, the more I see that it is THE GRACE OF GOD that makes the difference in our parenting. Are we responsible to train our children to the best of our ability and to set a Christ-like example for them to follow? Absolutely. But no matter how hard we try, we’re never going to do that perfectly. I’m human. So are you. We’re going to blow it way more times than we’d like. But God can use even that to show our children that they, too, need to repent and ask forgiveness. Sometimes they’re going to mess up quietly, and hardly anyone will know about it. And sometimes it may be spectacularly, where everyone knows. In either case, they need to know that we as parents still love them, and are there for them. We walk through the struggle together. So much more important than what other people think is the relationship I have with my child, and the relationship we each have with God. And one of the best – yet hardest – parts of all this is how God is changing me through parenting. I’ve grown in trusting Him, in understanding grace, in realizing how much I need His wisdom. He gave me my individual kids with their unique personalities for a reason. I believe a big part of that is to show me how weak I am on my own, and how much I need Him to help me on a daily basis. So here are a few things to remember when we start to focus on what others think of us as a mom. Be kind to other parents. Most of us are just trying to get this right, and doing the best job we can. Lose the judgment, and be encouraging instead. Parent your children according to Bible principles. God knows more than anyone else about the best way to teach and train our kids. Let your kids fail sometimes. Don’t micromanage their lives so much that they never get a chance to learn the consequences that come from making a mistake. Whether it’s forgetting their homework or not turning in that sports form on time, there’s rarely a better way to learn a life lesson than having to deal with the consequences. Don’t assume you know the whole situation, in your own family or someone else’s. When dealing with your own child, don’t jump to conclusions. Make sure you know exactly what happened. And if you see someone else’s child struggling in some way, don’t assume that the parents don’t know or don’t care. Give grace to that family in the same way you’d want grace shown to yours. Live honestly and sincerely before your kids. Teenagers especially can spot a hypocrite a mile away. Ask your children for forgiveness when you’ve wronged them. Let them know you face some of the same struggles they do. As we parent our precious children, may God give us wisdom to do what’s best for them. And may we all grow together in loving one another, and in glorifying God with our lives. 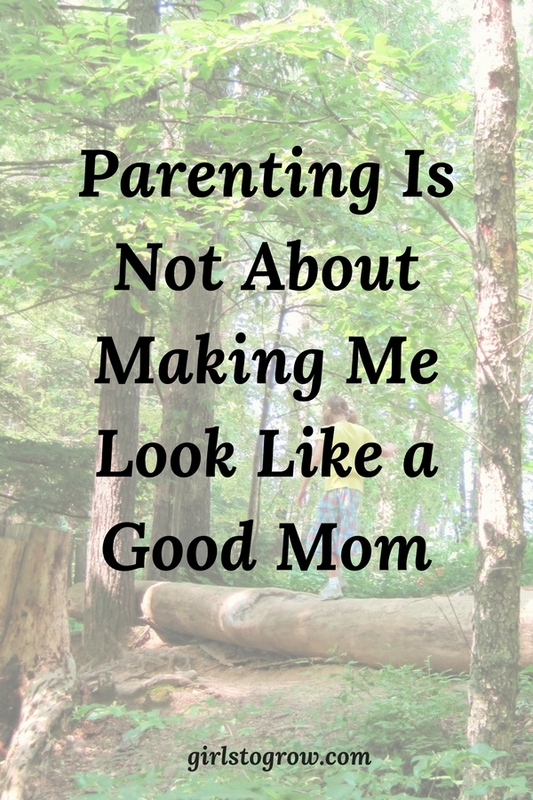 Am I a “Good-Enough” Mom? You give great advice for us parents! I’m learning not to judge other mothers when I see their struggles out in public because, you’re right, I have no idea what they’re going through. And I certainly don’t want to be judged when my children misbehave! It somewhat reminds me of how, before I had kids, I’d think (though I don’t know that I ever actually said it out loud), “My child will never….” (fill in the blank with some bad behavior). Well, my kids certainly did do some of those things! I hope that’s given me empathy for other mothers when I see them having a difficult time with their children. The older and more independent of us our children get, the more that our influence is the most effective parenting tool we have. Influence is of no value if our children aren’t in relationship with us, so I try to keep that in mind as we work through issues with our girls.